Cool.What's the status of the game? I'm glad you didn't give it, Nisaba. This mod must definitely be done. Oh wow! That looks fantastic! 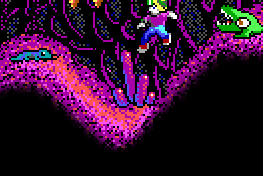 It's amazing to see what great artwork people can pull off even with the limited 16 color EGA palette. I am so excited for this mod! Looking fantastic! I have always loved the more natural outdoor locations explored in keen games and mods and this stuff really hits the spot! Really liking the creative sprite ideas, I always have a hard time coming up with unique and distinct looking creatures for mods but you've got it down pat Nisaba! Fantastic, ideed. 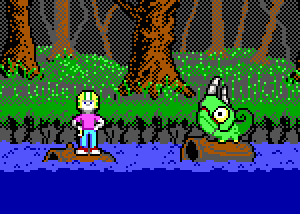 It's amazing to see what great artwork people can pull off even with the limited 16 color EGA palette. Interest? Sure! Skill? Only one way to find out. I'm coming out of my multi-year lurking mode just to say that this looks really beautiful. You have a real talent for artistic design and good balance. One of the best I've seen. All of those screenshots look so interesting. 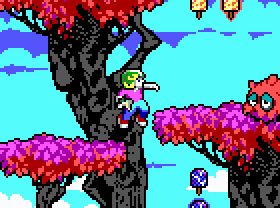 Oh, also of all those screenshots, the blobby green trees in #6 look like they could use a bit of refinement (not quite sure what, possibly the shading... I'll try to show what I mean later today). this mod is evolving beautifully thanks to all the wonderful Keeners around here. It' a real blessing that I can work with a lot of talented and inspiring people. Thanks for the news. Please don't give up! So the patching is all done then? Just the remaining animations, tileset and level design left? How exactly have you sketched out the levels that you already have? Regarding my idea for the trees, this sort of thing, maybe? I tried to use the same type of shading gradations as in the Keen 5 title screen. I'm more happy with how the left side of the tree shading came out than the right side (been a long time since I did this, and it takes so long. Are there any pixel art-specific tools that make this sort of shading quicker to experiment with these days?). Are there any pixel art-specific tools that make this sort of shading quicker to experiment with these days? There's mtPaint, which was developed with pixel art in mind, and has the ability to paint full dithered patterns with a single brush stroke.